With so many metrics available for tracking your performance on social media it might seem at times to be a bit overwhelming. Social marketers are continually inundated with metrics and that’s what makes our job so tough. Last month our friends at Buffer published a great list of 61 Key Social Media Metrics. Cherry-picking a handful of metrics or KPIs that your business cares about is a great way to put theory into practice. In this post, I’d like to share our list of what we believe are the 6 most important social media metrics you should be tracking and reporting on weekly, fortnightly and/or monthly. The great thing about these particular metrics is that they are channel agnostic. So no matter what social platform(s) your business uses, they will all be relevant. The metrics are overlayed on the typical AIDA (Awareness, Interest, Desire, Action) marketing funnel. Despite the fact that the funnel is over 50 years old, it is nonetheless a great way to communicate the value of these metrics to everyone in the business. This is where we start to get down to the pointy end of the AIDA funnel. CTR will give an indication of how effect your content is at driving visitation to your website. If your objective on social is purely engagement then perhaps this metric won’t be as important to you. But for the vast majority of marketers, there will be pressure to prove the business value of social media. Comparing the CTR of social against your other digital channels like e-mail, display, paid search etc is a great way to communicate that value. Whether you report weekly, fortnightly or monthly, you will need to track each metric against your performance during the previous period. As the legend in the chart above implies – ER, CGR and CTR have the added benefit of being able to be benchmarked against competitors. This will provide a great way to set future performance targets, rather than just plucking numbers from thin air. It will also allow you to answer that question of whether your performance is actually good or bad. Without competitive benchmarking you won’t have any context upon which to answer that question. To assist in automating your benchmarking and reporting, get started with a free Social Status account now. 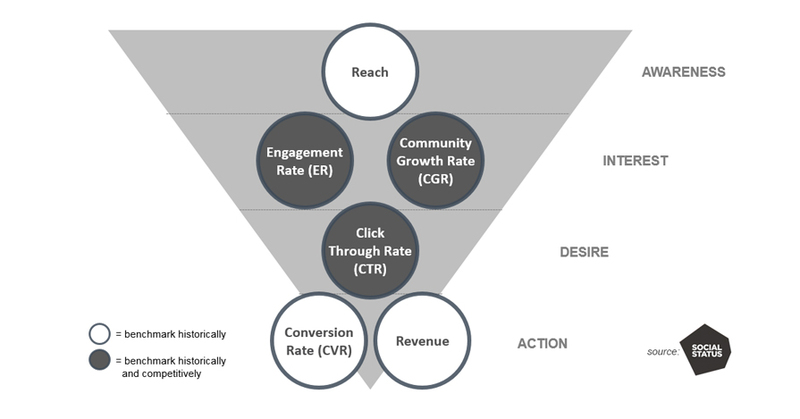 We’d love to know what you think of the Social Media ROI Framework. Tweet your thoughts and make sure to include the #socialstatus hashtag.